Dean Court Stadium currently known as Vitality Stadium for sponsorship reasons is the home ground of coastal football team, A.F.C Bournemouth. Last renovated in 2001, the 12,000 capacity venue is occasionally used for music concerts with Elton John being the most notable performer to date. The first match officially played by A.F.C Bournemouth at Dean Court was on the 1st September 1923 when an estimated 7,000 fans witnessed a 0-0 draw against Swindon Town. 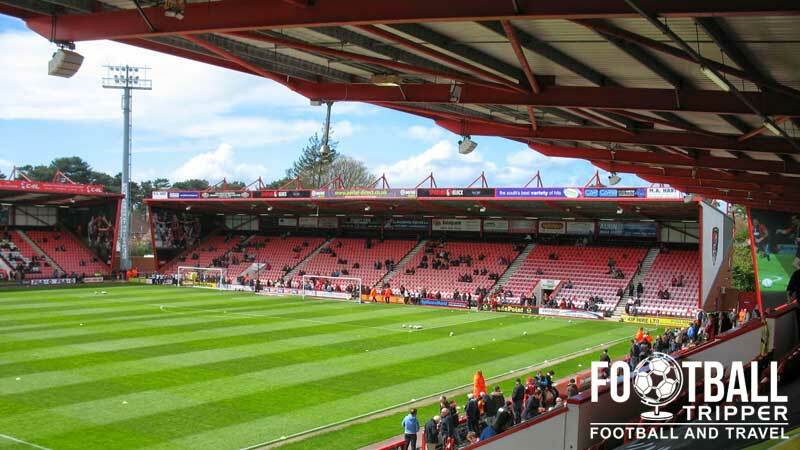 Before this The Cherries, were known as Boscombe F.C and the club first moved into Dean Court in December 1910 after taking longer than expected to clear the former gravel pit. 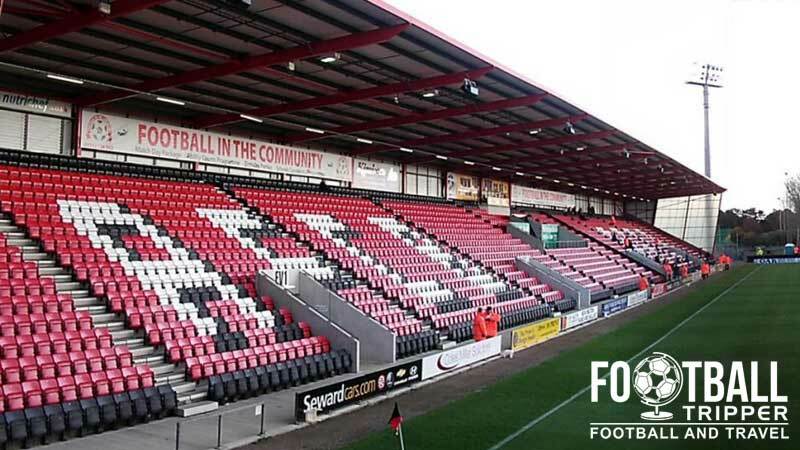 Previously owned by the Cooper-Dean family, the name of Bournemouth’s stadium is said to derive from the former owner, although in recent years it has come to be known by a number of sponsorship names. From the start of the 2001-2002 season onwards it was officially known as the Fitness First, then Goldsands and now Vitality Stadium. The largest ever attendance at Dean Court was set on 2nd March 1957 against Manchester United in an FA Cup match. 28,799 fans crammed into Dean Court to watch the match, with the league attendance set almost a decade early in 1948 when 25,495 fans witnessed a disappointing 1 nil defeat to Queens Park Rangers. Originally furnished from old fittings from the British Empire Exhibition Stadium, the ground was entirely rebuilt in 2001, with the project so large in scale that the club were forced to play their first eight fixtures of the season at Dorchester’s Avenue Stadium. The extensive renovation saw the pitch rotated 90 degrees to limit the impact on nearby housing. Initially consisting of just three stands like Oxford’s Stadium, a decade after opening a temporary south stand was erected during the 2010-2011 season. Removed the season after, a permanent section of seating was built after the club were promoted to the Championship for the 2013/2014 season resulting in today’s current capacity of 12,000. Goldsands stadium is comprised of the following four sections: The Steven Fletcher Stand (North), The Energy Consulting Stand (East), The Ted MacDougall Stand (South) and The Main Stand (West). 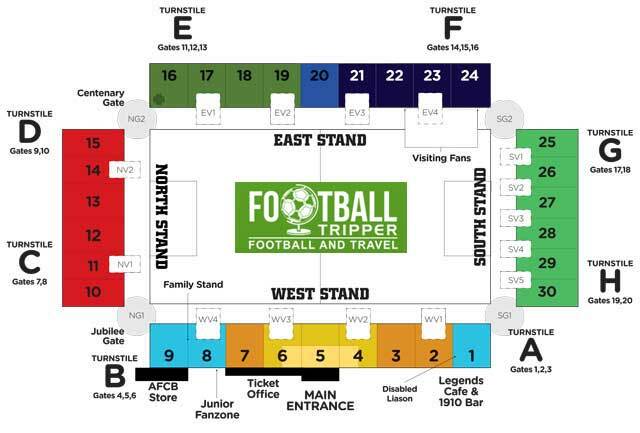 Away fans visiting Bournemouth are housed within sections 21-24 in what is currently known as the Energy Consulting East Stand. 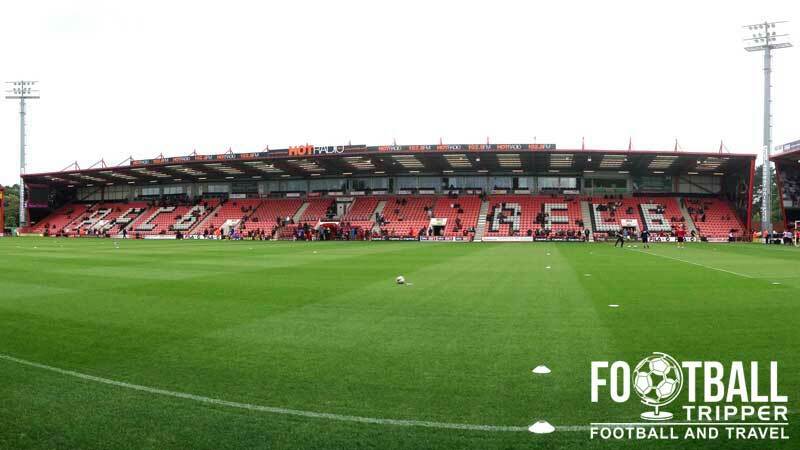 Running for the length of the pitch opposite the main stand, the standard allocation of around 1,500 seats means that away supporters share the East Stand with Cherries fans. The allocation can sometimes increase to around 2,000 or so for the larger matches or cup games where the numbers are more generous. As one would expect from an intimate stadium, the views throughout are generally superb, and entrance is gained through turnstile F.
For home fans or for those wearing neutral colours there is a supporters bar at the ground known as “1910” as well as The Queens Park Hotel which is five minutes from the ground on Holdenhurst Road. Sticking with the aforementioned Christchurch Road where Pokesdown station is located on is probably your best bet food wise. There are a number of cuisines represented here ranging from Italian to Indian, and carnivorous to vegetarian, with a Sainsbury’s supermarket at the end of the road for good measure. Alternatively you can purchase AFC Bournemouth merchandise from their official online store: http://www.afcbdirect.co.uk/. For Saturday 3.00 pm matches, the shop is open from 9.00 am until kick-off, and for 20 minutes or so after the full time whistle. It doesn’t appear as if AFC Bournemouth currently offer fans the chance to undertake a stadium tour of Vitality Stadium. If this changes, we’ll be sure to update this section. You can purchase tickets to watch the Cherries through all the usual channels such as Online, via telephone (0844 576 1910) and in person at either the club store or either the BIC or Pavilion ticket offices. 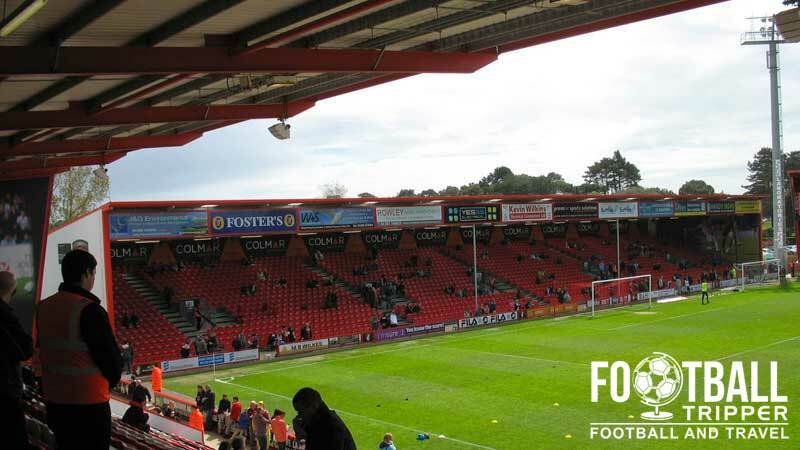 The stadium is located around 2.4 miles from Bournemouth city centre but as it is a coastal town which is rectangular in shape, it could be much closer depending on your starting point. Vitality Stadium, King’s Park Drive, Bournemouth, Dorset, BH7 7AF. The Cherries operate a supporters’ car park located behind the new south stand available on matchdays for the bargain price of just £1.00. Sadly there is limited space so be sure to get there well before kick-off if this is your plan A.
Bournemouth Central Station is around 30 minutes from The Cherries’ ground with this station acting as the main railway hub of the town – you’re likely to travel into here and then catch a smaller train to Pokesdown which is only 1 mile from the ground. Upon exiting this station turn right down Christchurch Road (A35) and after 400m or so so turn right onto Gloucester Road. Follow this road all the way and you will arrive at Dean Court soon enough. For a complete list of Bus routes and timetables please visit More Bus Wilts & Dorset with the M2, X1, X2 and X3 buses all dropping fans off within walking distance of the stadium. In addition to this Yellow Buses operate some services between Bournemouth and Pokesdown train stations but we’re currently unsure of the exact number of the route. The two closest hotels to Dean Court are the Queens Park Hotel and The Portman although neither seem to have many reviews which gives away any positive or negative traits.